The Puna Teal is the largest of the three races of South American Silver Teal and is abundant throughout its range in Andean pampas marshes from central Peru to north western Argentina. The male and female have very similar plumage and no eclipse so they are another species that is particularly suitable for a mixed collection. They are a very long narrow bird with a very distinctive long powder blue bill and I would guarantee that anyone seeing a Puna Teal for the first time will ask 'what is that duck with the bright blue bill'. Puna are hardy and will thrive on grain and pellets but with this species pellets should form the greater part of the diet and should be available add lib especially during cold weather. While Puna's are an ideal addition to any mixed collection and are relatively easy to care for it should be noted that they do not enjoy competition. If life is uncomplicated they thrive, if they are able to push other waterfowl they will thrive, if they are pushed and have to compete with other waterfowl for feed etc. they very quickly become lethargic and can be lost. Their breeding displays are subtle but delightful to watch and breeding can be expected in the first season and they usually start very early, they will often start in February and further clutches can be expected throughout the season that can easily extend through to September. Puna clutches are small, four eggs is quite normal and six while not unusual is a very good clutch, the eggs are pinkish white and elongated and appear slightly more delicate than eggs of most other waterfowl. Nest sites can be very varied, they will happily chose natural cover if available and a favourite site is certainly in the top of a clump of Pampas grass and this may well be similar to a site they might chose in the wild. If natural sites are not available they are equally happy to use nest boxes, I think there may be a slight preference for a box with a large entrance hole and raised slightly off the ground. Incubation takes about 25 days after which the very fluffy grey ducklings emerge. Thy are particularly friendly ducklings but as with the adults life must not be to complicated, if reared as a small brood they will thrive. However the small clutch size means that the brood will be small and there is always the temptation to try and mix them with something else, this can be achieved but care must be taken, they really do note cope with being bullied and can be easily lost. As juveniles young Puna certainly benefit from good quality water otherwise they can get wet feather and this needs to be avoided. 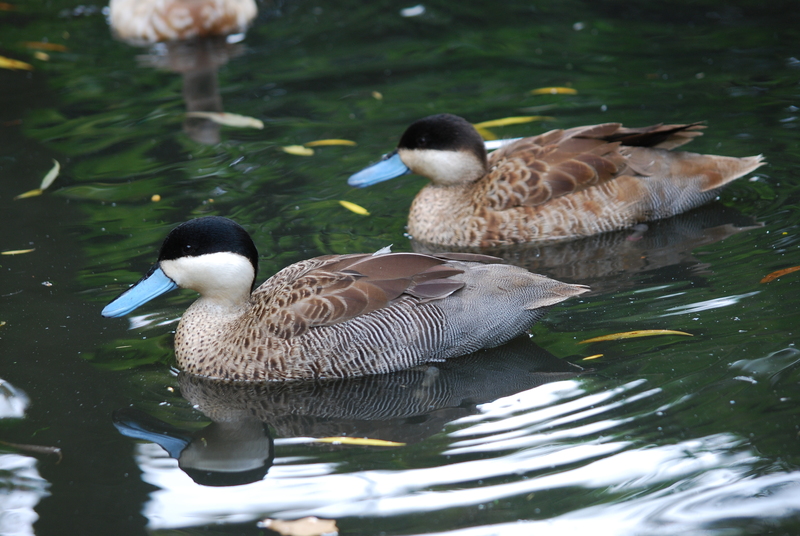 If Puna Teal get wet feather they will very quickly get pneumonia at the onset of winter and will succumb. While rearing Puna is not quite as straight forward as most other waterfowl their requirements are still relatively easy to provide and they are a delightful species to keep. Adult Puna trio and 3 day old ducklings. Puna Teal make very good parents and provided there is not to much disturbance from other waterfowl they will parent rear very successfully. The male Puna also takes a very active part in the rearing and defence of the brood. 24 hr old Puna ducklings. Puna Teal are very easy to rear artificially, but they do not cope ell with competion from other ducklings and are best reared on their own as a sibling group. Approx. 6 week old Puna Teal. Note that while virtually full grown they are still in their sibling group. They are best not mixed with other waterfowl until they are moved to the next and final stage being the nursery pond with other young waterfowl where they can harden off and become accustomed to a little competition from other waterfowl. Well grown young Puna Teal that are getting accustomed to life with other waterfowl. Note that Puna are some of the easiest waterfowl to rear provided they are the dominant birds. Until they are fully grown and hardened off they do not want too much competition from other waterfowl. If put under stress from other waterfowl they will quickly decline and losses can occour.